Over at Amazon, today’s deal of the day features a Dewalt 100pc drilling and screwdriving bit set, DWA2FTS100. 14pc gold ferrous PilotPoint drill bit set. This set was on sale during the 2017 holiday shopping season for $25. Reference link. 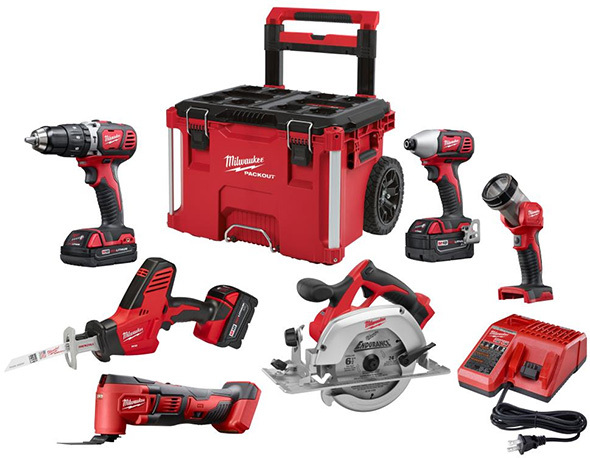 Home Depot has a bunch of tool deals today, featuring Milwaukee M18 cordless power tool and Packout combo kits, some Ridgid air tools and compressor kits, Ryobi air tool and compressor kits, pneumatic accessories, a Milwaukee M18 High Output battery pack bundle, and some Milwaukee power tool accessories. The deals are good, but nothing we haven’t seen before, except maybe the M18 6Ah + 12Ah + Rapid Charger starter kit bundle for $249. Over at Lowes, they have this Dewalt 20V Max brushless cordless power tool combo kit and brushed motor angle grinder bundle on sale today. 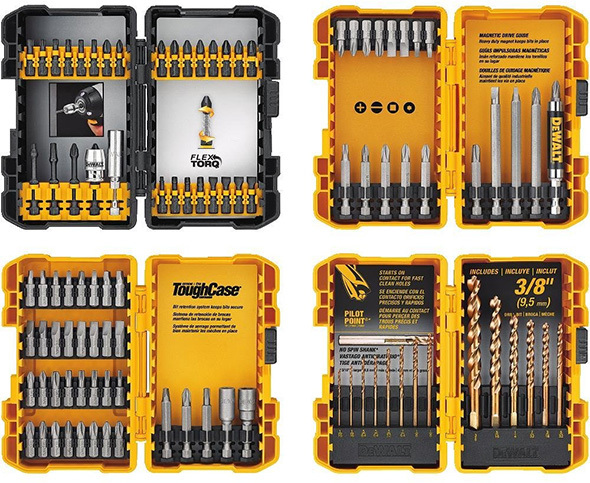 The combo kit is currently priced at $319 at Amazon, and with a free impact driver promo. So, with the Lowes deal, you’re saving money and getting a free cordless grinder that you might be able to use. The bundle comes with the DCK299M2 premium hammer drill and brushless impact driver kit, and DCG412B angle grinder bare tool. All of the deals end at 3am ET 2/1/19, unless supplies sell out sooner. 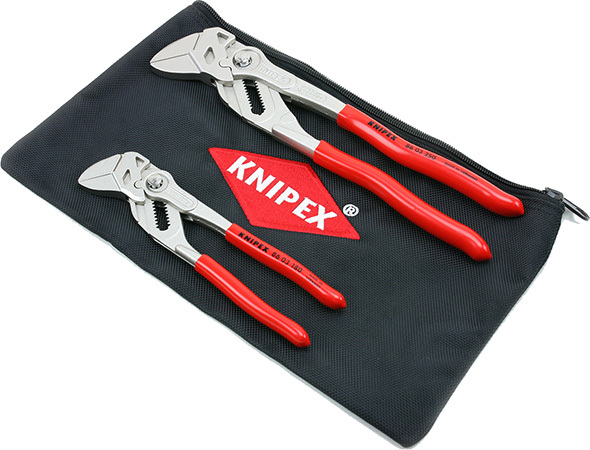 KC Tool has this Knipex Pliers Wrench set on sale today, model 9K-00-80-109-US. The set comes with 7″ and 10″ tools, and a zippered pouch. Note: Our KC Tool coupon does not work on deals of the day anymore. HD has the same M18 fuel set on sale they had a couple weeks ago for $239. I ordered it then and put my old ones on eBay. Essentially breaking even after selling the Packout box and the 5.0 battery. Kept the 2.0 battery myself. I really like the smaller lighter batteries. No, they had these same M18 and Packout bundles at these prices, $239 for the small combo, $399 for the larger, they’re discounted from holiday season special pricing. This is the second such deal of the day for the bundles. On the Lowe’s deal, you actually have your choice of: grinder, rotary tool, vacuum, impact driver, blower, or radio. There is a drop-down box to make the selection. Man, I really want to pick up the Knipex Pliers Wrench set but I can’t justify spending that much as a homeowner. Even the 7″ by itself is too much to justify as a homeowner. @Jon – that’s exactly how I think about it! Don’t get me wrong, I know my tools have more than paid for themselves with the exception of some of the woodworking ones but those eventually will. It’s just very hard to justify spending $50 on a Knipex pliers wrench when I already have wrench sets, socket sets and tongue and grove pliers. My miter saw has helped put up molding in 2 rooms so far, rebuilt 2 decks, built 2 kitchen tables and more. It’s amazing how quick those things pay for themselves. I understand the Knipex dilemma. Maybe it’s a bit of rationalization – but I also notice that when I have the right tools, I can be far more efficient, and I’m able to jump on various tasks far more readily than if I stuck with my older less capable tools. Much as I was interested in cordless tools for a few years, I never felt that I could justify spending the money when I had perfectly service Makita and Milwaukee corded drills. But once I finally took advantage of a Home Depot sale a few ago and came home with a Ryobi super combo, the tools were so useful and accessible that I started tackling far more projects on my own than I had in prior years – even though I had already owned a couple of electric drills. I’ve had old sanders for years, but when I finally got a 5″ random orbital sander, it became reasonable for me to attack and refinish several pieces of older furniture. Convenience, accessibility and ease of use make a big difference for me with regard to the number of projects I’ll tackle. The Kniper pliers wrench might be a bit harder to rationalize when you already have sockets and/or fixed wrenches. For me, it’s helped quite a bit as I load up a tool bag when I’m approach a new project and carry the tools there: if the Knipex Pliers Wrench can replace a slew of wrenches in my bag, and I don’t have to lug my huge set of sockets with me, it really helps! I have not tried them yet. But they are half the price of the knipex. While those Irwin’s are nice examples of slip joint / channel lock type pliers, they really serve a different purpose than the Knipex pliers wrench. The Knipex jaws are perfectly parallel and remain that way through that range of motion. The jaws are also perfectly smooth. The pushbutton release lets you adjust them to any of 13 width ranges quickly, and the handles open and close to operate the parallel jaws within each range. Among other uses the Knipex function perfectly as a true adjustable wrench, grabbing any nut tightly, with more precision than any other “normal” type of adjustable wrench. You get a tight grip on the nut, with absolutely no marring since the pliers jaws are parallel and completely smooth. While slip joint / channel lock type pliers are incredibly useful in themselves, and there’s a visual similarity to the Knipex tool, they’re really quite different in form and function. I don’t think you actually clicked those links. The pliers I linked function EXACTLY like the PLIERSWRENCH. there packaging actually says plierswrench right on them. same stepped position parallel smooth jaws. Hey Matt — my apologies — my mistake. You are absolutely right. They do, indeed, have the same “pliers wrench” name, and appear quite similar (maybe the same). The description is certainly virtually the same also, and as you note, like the Knipex tool they have stepped parallel smooth jaws. I’m wondering now if they’re sourced from the same place, and what differences, if any, there are. The different price point certainly makes it worth checking out the Irwin tools. Thanks! And again, please accept my apologies for jumping to conclusions and being wrong. Thanks, I may have to go check them out in person. I know it’s really late in the day for this, but if anyone has been waiting for a “deal of the day” on Ryobi One+ AirStrike nail guns, Ryobi and Home Depot had a great sale today. I believe it runs till end of day today, 1/31. I just checked the HD website — it’s about 11pm Eastern Time right now, and the site indicates that the sale runs 4 more hours, so we can figure that it runs till 3am Eastern Time, 2/1/19. I jumped on this, as I’ve been waiting to get a good price on two Ryobi One+ AirStrike tools: the 18 gauge brad nailer, and the 16 gauge finish nailer. While this sale is on, Home Depot is knocking $90 off the price of a pair of the tools along with a charger and a single battery, bringing the combo down to $259. These are the two tools I’ve been waiting to buy, so they’re what I’ve focused on, but there are a load of other cordless tool deals on the site as well as part of this “special buy” promo, with excellent prices on Milwaukee (many in the range of 50% off! I ordered the cobalt drill bit set at 46% off), Ridgid, etc. If you can get to HD’s home page before 3am Eastern Time (less than 4 hours from now) you’ll see an ad for this special buy promo.